What if the speed of light was not the universal limit? What if the tendency to give it such a moniker, and for experimental evidence to point to such a conclusion were not flawed, but required just one more step; that it required a slight chaotic element to establish true mirrored workings on paper for what occurs in reality. The universal speed limit is, perhaps, an indefinite speed slightly faster than that of light. This speed would be the barrier between traveling forwards in time (slower than the barrier, as we are) and traveling backwards through time. When an object approaches this speed, time slows down, as relativity predicted and observations show. The difference is that, when the speed is reached, the object is essentially stuck in a single moment of time. If one were to physically accelerate to this speed, the rest of the universe would pause, and then perhaps run in reverse, from the perspective of the subject. If this were possible, conjecturing further, what would happen to the object that exists, moving, through this frozen universe? A particle would physically exist apart from the normal universe, separated from the normal temporal dimension. The object would move instantaneously, so there is relatively little chance of observing minute details. In any case, the likelihood of achieving such a speed is quite low, and what would happen is unexperimentable, and pure conjecture. Suffice to say that from our limited vantage point, an object pushed beyond the universal speed limit would certainly disappear, but after that point, it is anyone’s guess. The particle may reappear in a previous time frame, it may revert through mirrored motions on a newly-created spatial plane, or it may have the ability to travel instantaneously throughout the entire universe in a single instant without the use of energy, but be forever frozen within this snapshot world. Experiments have shown that virtual particles behave in a similar manner, attributed to quantum mechanical effects. 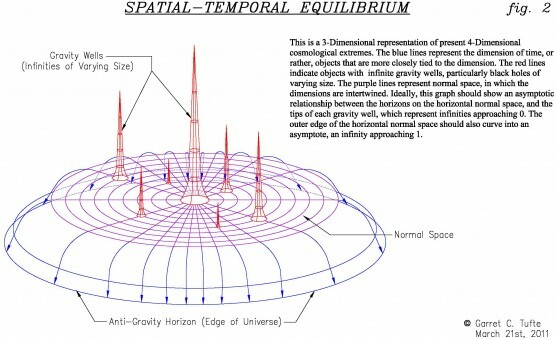 The same effect would occur with Spatial-Temporal Equilibrium. If it could be demonstrably observed, this hypothesis could undercut both relativity and quantum mechanics in simplicity. 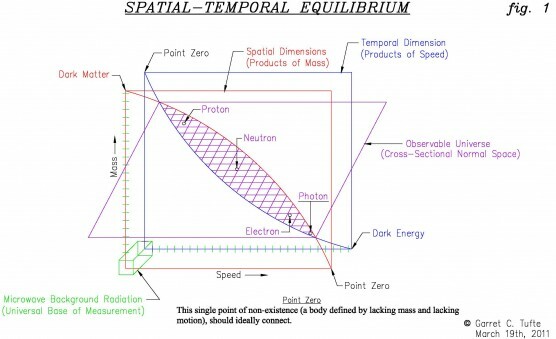 This is a representation of the relation between space/time and speed/mass. As an object’s inherent speed increases it moves closer to the x-axis, as the mass increases, it moves closer to the y-axis. A universal background is the basis of measurement for speed and mass. When the object’s speed, or its ratio of speed to mass, reaches the extreme, as, say, the universal speed limit, slightly faster than that of a photon, the object passes through space without being hampered at all by time. It loses all connection to the normal temporal dimension. If a person were to be propelled to this speed, they could very well move throughout the entire universe and witness the world as it was in that very moment that they crossed the threshold. The opposite would be true for a particle or system that reaches a threshold mass – it would exist in its own “space”, losing all connection to the normally intertwined spatial dimensions. So far, there is not much new in what I have proposed. It is a layman’s understanding of an aspect of general relativity with a slight tweak, with an additional symmetricity of mass. What starts to make this hypothesis unique, I think, is the inclusion of a rotating universal background. A rotating universe could mean that every atom and particle of energy is rotating around a center and that each particle is indelibly tied to this backdrop, or it could mean that the universe is a four-dimensional backdrop that happens to be the basis for all matter that we can observe, basically an invisible ether that forms the basis for true measurement. If the former situation were in fact, we would observe little noticeable effects. But, if the latter were true, the objects would gradually increase speed as they moved towards the outer edge of the universe, or rather, as the universe expanded. Try to imagine this universal background as the Big Bang afterimage, the microwave background radiation that permeates the universe in all directions in the same proportions. Practically, a backdrop of universal radiation would play the same role as an invisible background, or as a reference. It would be important as a uniform, functional slate. Eventually, the objects would reach the threshold speed described earlier. At this speed, a shell would be created around the axis that was rotating. If the universe rotated in one dimension, a cylindrical universe that continues forever in two directions would be created. If it rotated in two dimensions, it would create a shape akin to the intersection of two cylinders. If it rotated in three dimensions, it would create a more or less perfect sphere. Imagine this: a finite, expanding, spherical universe surrounded by a horizon that actively prevents the passage of time outside of it. Following this train of thought, one could see the universe as the exact opposite of a black hole as we understand them. They have within them a singularity that exists in a place so foreign to the normal universe as to be ripped from the space-half of the space-time continuum. In a black hole, the objects held within are completely motionless, moving through time infinitely. This is opposed to the outer edge of the universe, where an object would fly around at infinite speed. The center of a black hole has infinite gravity, whereas the outside of the universe would have infinite antigravity, which I will explain later. Objects are pulled toward the center of a black hole, while they are expelled from the outer edge of the universe. There are many black holes while there is only one “real” universe. The dimension of time continues on through a black hole while the dimension of space is stretched infinitely; outside the universe, the dimension of space continues while time is stretched infinitely. Black holes are, therefore, the opposite of the universe. Observe this diagram (see fig. 2). What significance does this hold? I am not sure, but it is interesting. Another part of this hypothesis has to do with how space and time affect matter. Mass, in the terms I describe, is the opposite of speed. Mass is a “product” of space, in that it is more dependent on space to define itself. Speed is a “product” of time, in that it is more dependent on time to define itself. In our observable, normal part of the universe, time and space are woven together (except in the aforementioned black holes and outside the universe), so an object born of space is naturally programmed to gravitate towards an object born of time, and vice versa. Such is the case with protons and electrons. Protons have more mass than they do speed, so they are at the space-side of the spectrum. Electrons have more speed than they do mass, so they are on the time-side of the spectrum. Space and time are meshed in the observable universe, so they have a certain attraction. Electromagnetic attraction can be explained in this way. As for gravity, it is the attraction between two space-oriented objects, or the attraction of space-oriented systems. Antigravity, therefore, is the repulsion between two time-oriented objects, objects like photons and electrons. Neutrons have a mass and speed that effectively cancels out both the gravity and antigravity of both functions; however, they are still acted upon by gravity and antigravity. Gravity and antigravity are opposites created by particles defined by their original position within the object that existed before the Big Bang. Or rather, they have coalesced into what they observably are, now, at a later date. But regardless how they came about, this hypothesis could explain their present behavior. I am unsure of how the subcomponents of these particles could or should behave until I have a better understanding of the present state of experimental evidence. But if I may make a conjecture based on not much more than the flawed understanding of this hypothesis, and half-remembered explanations provided by Hawking and Feynman, I would imagine that they operate with reckless abandon to the laws by which normal particles abide, because they should not even exist. Now my memory is not perfect, but I do remember that exotic particles created in accelerators seem to burn themselves out in nanoseconds. Perhaps in this respect, this hypothesis provides nothing new. The existence of the stable fundamental particles, their permeation throughout the universe, is a fact of constants and stability, that does not (hopefully) change, and that, I would imagine, cannot traditionally be explained, and any attempts at figuring the “why” of this fact is as asinine as asking why we are not living in a universe with four spatial dimensions. But the individual existence, however brief, of the particles that compose the subatomic particles is incredible evidence for the Big Bang itself, as is the idea that our present, everyday subatomic particles were created from a larger soup of exotic ones that coalesced into what we see today. I would say, for this hypothesis’s purposes, that the sub-subatomic particles’ motion and behavior, as well, could be explained by their attraction and repulsion based on their mass and speed, or perhaps their disappearance could be attributable to a speed faster, or a mass lower, than that of electrons, and a speed slower, or a mass larger, than that of protons. And everything in between that does not strike the perfect balance of the neutron, is incompatible with the reigning functionality of the traditional atom, and thus (sadly) cannot function within our universe. Those are the basics of my hypothesis, which I call Spatial-Temporal Equilibrium because it strikes a curious balance between the space/time, mass/speed, and order/chaos. What does this whole conjecture thus far mean? It means that the universe could well be much simpler. The intricacies of electromagnetism and quantum mechanics might possibly be explained by the interaction of gravity and anti-gravity created by mass and speed. Furthermore, relativity could be combined with quantum mechanics, following the formulation of rules based on this train of thought. The motions of massive objects and tiny particles could be calculated with a single formula. This hypothesis could also explain a few cosmological mysteries. The abundance of the gravitational effects of dark energy and dark matter could very well be multitudes of matter that is trapped beyond the threshold of speed, or conversely, below the threshold of mass. This could mean that there is matter flying around the universe that is everywhere and nowhere all at once, in a sense, the great particle “heaven”: matter that went a little too fast and ripped itself from time and runs only in the dimensions of space, the space-only universe. But the effects of their existence would still be observable through its own antigravity, and although they exist in a space-only environment, because the same thread of space also exists normally, they could still affect the space-time universe. The same is true inside a black hole, or mini-black holes so small that no other particles can get “close” enough to the time-only universe to be unavoidably attracted. But at the same time, matter pulled into a traditional black hole is ripped from the space part of space-time. So particles may find themselves trapped within the “hell” of the time-only universe. Regarding the Big Bang, as there is no difference in cause for either speed or mass, they might, in fact, both come from some other mysterious determining factor, say for instance, their placement within the singularity that imploded. Or then again, speed may be the determining factor, say that the placement of each particle, let’s say arbitrarily, within a sphere, their speeds could be predetermined without having the need for mass to have been existing. The connection between both of these factors could be found with a 3-dimensional+ object that explodes, but only required the placement of any particle that exists in the universe. This lends support to an explosive beginning. Now, I understand that experiments have been conducted and, more or less, conclusively show that light can be accelerated to a much faster speed, in a particular setting involving an “ether” of plasma. Beyond that, I don’t know the details. And my present training in mathematics and physics is woefully inadequate to even begin to analyze data of that nature in the context of modern science, to say nothing of knowing how it may lend support to, or disprove, this hypothesis. But I would guess that the plasma that allows light to move at such a speed would have to be, on the whole, fundamentally, in the most basic way, completely distinct from the composition of the rest of the universe. And honestly, I can hardly believe that the stuff exists. I should wrap this up, but I have a feeling that there is much more to this idea. It all begins with a premise, and follows a train of thought that has some elegance, and uniqueness, that could benefit the science. I should like to say, as well, that we should understand that if advances in the physical sciences are plateauing, that if we cannot find the lynchpin that fits the pieces of relativity, thermodynamics, and quantum mechanics yet, and if our experimental requirements for finding this “missing link” still require building more and more massive particle accelerators indefinitely, to create masses of information that cannot even be reasonably analyzed, then we should give at least a slight consideration to other avenues of thought. This is an avenue that would require an investment of nothing more than university access to the person presenting it. And it is especially important, in our present state of global shift and potential disaster, that we make discoveries that promote peace and understanding. Or at the very least, give these possibilities a chance. As for this hypothesis, which has been sitting on a shelf for years upon years collecting dust, it is, in all likelihood, presently, not the great, shining hope of reductionists everywhere. But holding onto the hope that something could come of it, that it may hold some value, whether in its present condition or one of the future, will not change. I could not forgive myself if I were to abandon an idea that, in my heart of hearts, I believe can contribute to the science. In which case, I will continue with the train of thought upon which this hypothesis runs, until we find that mysterious “theory of everything” or I cannot advance the idea any further. My gut feeling says this: that there is value to the ideas advanced here; that there is much more to be discovered, perhaps in fact, within this framework; that there is some scientific value that may be found through further investigation and study. I would estimate that with rigorous training and focused work, I could take this idea as far as it could go within two years. Or I may find something else. But I would expect, in any case, that my contribution, whatever it might be, to the science of physics could be complete within that time frame, and that that part of my mind could then be free to explore other avenues. In any case, I am not getting any younger. Whatever my inclinations may be, whatever I must do in this life to continue living, such that I can work on projects such as this, I must do. This provides a stumbling block of sorts: in that I require nothing more than food, a roof over my head, and access to a university to complete this project. I have a thousand other ideas that obsessively require completion in my mind, but this is one of the major ones. If I could have a chance to focus myself upon it, not only could I contribute something of at least tertiary value to the science, but we might, just might, have another ingredient to find the truly all-inclusive physical law.